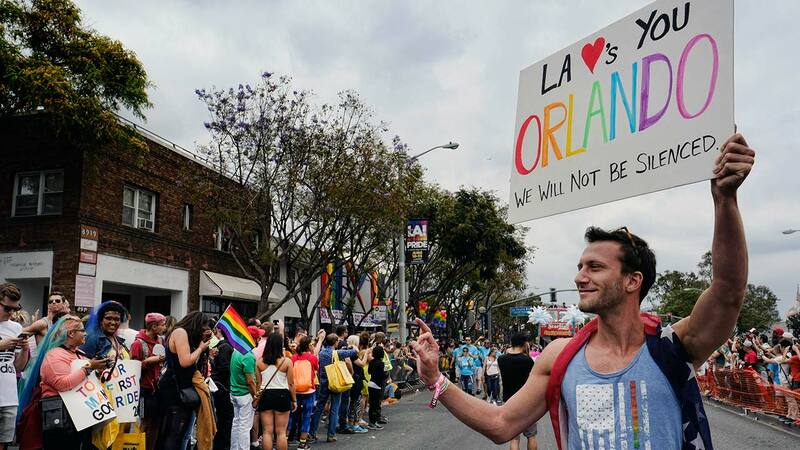 Branden Joyce holds a sign in support of the shooting victims in Orlando, during the gay pride parade in West Hollywood, Calif. on Sunday, June 12, 2016. ORLANDO, FL -- A GoFundMe account set up for the victims of the Orlando, Florida mass shooting has already raised more than $2 million. The fund, which was set up by Equality Florida, an organization that advocates for gay and lesbian rights, hit $2.1 million within 24 hours. That makes it the most successful campaign in the history of the website. Equality Florida said the money raised will go directly to the victims and families of the shooting at Pulse Nightclub. Orlando police said 29-year-old Omar Mateen of Port St. Lucie, Florida walked into the gay nightclub around closing time early Sunday morning and opened fire, killing at least 50 and injuring another 53 people. Mateen was eventually killed during a shootout with SWAT officers. The attack was the deadliest mass shooting in U.S. history. If you'd like to learn how to contribute to the GoFundMe effort, click here.